‘Flying Scotsman’ will now be on display at Ingrow on Saturday 1st and Sunday 2nd April only. The locomotive will be hauling passenger services on the second weekend due to unexpectedly high demand for tickets for the weekday service resulting in us now increasing the number of days in passenger service. Flying Scotsman will be in steam and on display at Ingrow West between 09.00 and 18.00. Entry to Ingrow yard will require a special day ticket to be purchased and will include unlimited travel on our steam trains between Oxenhope and Keighley. 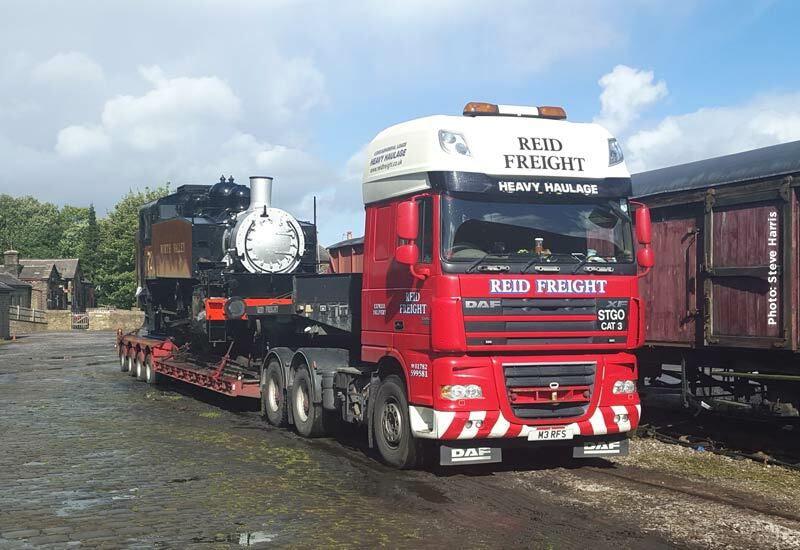 Tickets for travel should be purchased on the day and will include viewing the locomotive from the public area and entry to the Museum of Rail Travel and Ingrow Loco Museum. Passenger services behind our own steam locomotives will operate every hour from 08.30 – 18.30. 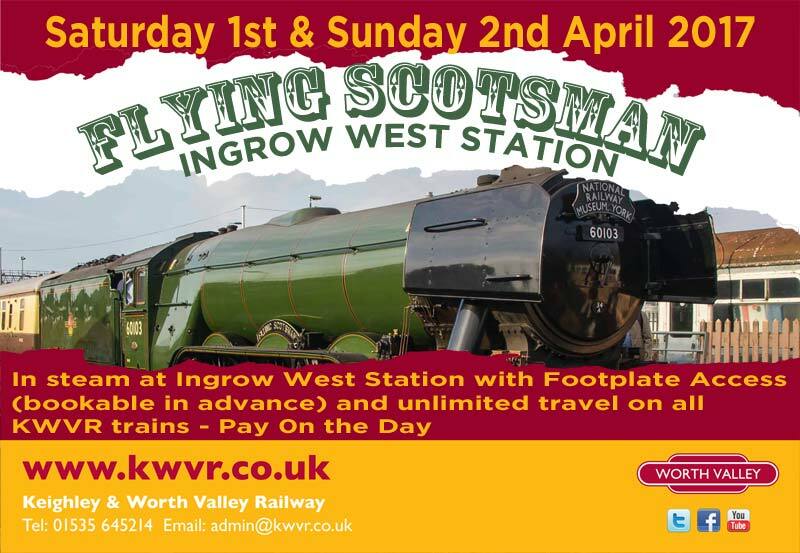 Please note advance booking is NOT necessary to come and see Flying Scotsman whilst on static display at Ingrow.. There will be a bar on site in the yard serving hot and cold drinks as well as alcoholic beverages and refreshments will be available on both days. 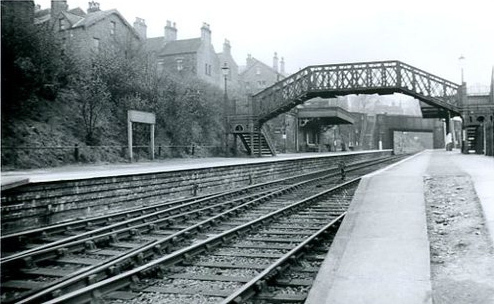 Ingrow Station and the Ingrow Yard area will only be accessible by taking a train from one of the other KWVR Stations and alighting at Ingrow West. The car park will be closed on both these days and pedestrian access is suspended for the weekend. Visitors, not arriving on the Railway at Keighley, are advised to either park at Oxenhope, where there is free parking in the station area and an overflow car park a short walk away, or we are operating a free park and ride scheme at Penistone Hill to Oxenhope which will be clearly signed, just follow the AA signs that will be in place over the weekend. The “Flying Scotsman Experience” allows access to the locomotive itself and includes a 15 minute interpretive talk about the loco followed by a walk through the cab and, if you so wish, the tender, following in the footsteps of generations of enginemen who passed through on their journey at speed from Kings Cross to Edinburgh. Tickets for the “Experience” will cost an additional £10 per person and will be sold for specific time slots at 20 minute intervals between 09.00 and 17.40. Tickets will be available in advance and go on sale from 1st February by phone to our Haworth office on 01535 645214. The initial ‘Flying Scotsman event envisaged 5 days of running throughout the week with the locomotive on static display at Ingrow West, at the weekends. Due to unexpectedly high demand we added extra trains to the midweek service but now with all the Pullman seats sold and virtually all the standard class seats, we are pleased to announce we are now running ‘Flying Scotsman’ on Saturday 8th and Sunday 9th April. Both first class Pullman and standard class seats are now available on both days with 5 trains per day. ‘Flying Scotsman’ will be hauling passenger trains between Keighley and Oxenhope each day. This is YOUR chance to ride behind Flying Scotsman! 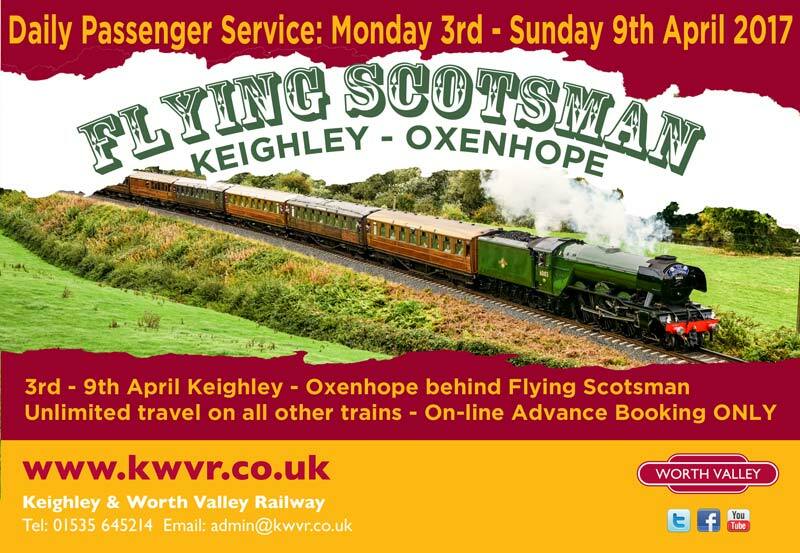 ‘Flying Scotsman’ will haul your train from Keighley to Oxenhope and one of our resident steam locomotives will take the train, with Flying Scotsman on the rear, from Oxenhope to Keighley. Tickets MUST be purchased in advance and will be valid for one round trip only (journey time around 70 minutes) from either Haworth or Oxenhope. Your advance ticket will also allow unlimited travel on our other steam train running on the same date, so you can make a day visit to the railway if you wish. £10 child (young children who do not require a seat can travel free of charge). Each day one of our two Pullmans coaches, Mary or Ann, built in 1930 as a pair for the Southern Railway ‘Bournemouth Belle’ service, will be attached to every train. Complimentary hot drinks and croissants (morning departures) and cream teas (afternoon) will be served. A premium fare for luxury travel in the Pullmans will apply. 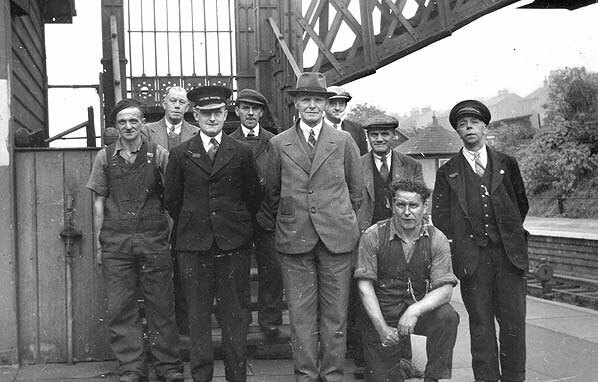 However, the Railway has received some excellent news from the Principal Engineer in the Highways Structures Unit at Bradford MDC. The Council have completed their assessment of Ingrow River Bridge (on the road just outside the station) and assessed its capacity as being ‘SV120’ – i.e. 120 tonnes gross vehicle weight. As a result we are delighted to announce, with a great degree of relief, that “movement of heavy railway engines over Ingrow River Bridge may now resume.” The Railway would like to express thanks to all concerned for their perseverance and patience with this and are grateful to Bradford MDC’s engineers for bringing this to a successful conclusion. In anticipation of the questions that will now be on everyone’s mind, we cannot, at this stage, advise on any dates for locomotive or rolling stock movements into or out of Ingrow and announcements will be made in due course when any movements are finalised. Step back in time and explore the science behind the steam locomotive with some fun activities and experiments with our expert scientists. Parking is plentiful or park at one of our other stations and take the steam train to Ingrow (West) that will be in operation all day. When you are visiting the Railway with your children or grandchildren to ride on one of our Santa Specials on the 7th December or you are in the area on the day, then come along to Ingrow Station and the children can still join in the activities. For details and information, click HERE to visit the Christmas at Ingrow page on the main website.